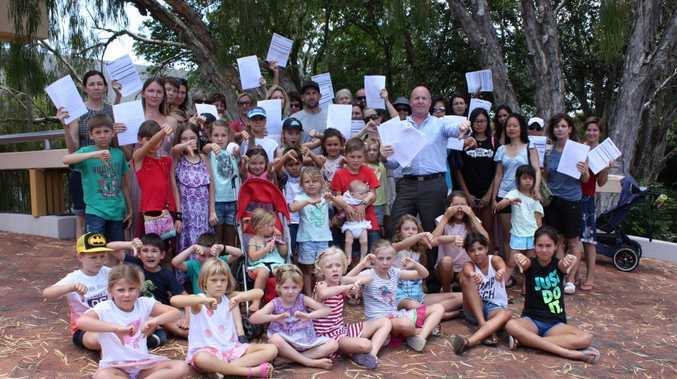 ANGRY parents and residents opposed to a proposed service station adjacent to a Noosaville school converged on the Noosa Council office on Friday, armed with around 200 formal submissions and a clear message of discontent. Objections to the development application had to be lodged by Friday - just 15 business days after the signs announcing the proposal were erected on-site. The block is at the corner of Eumundi Rd and Walter Hay Dr, next door to the Good Shepherd Lutheran College. The land is owned by the Lutheran Church. A group of concerned parents has been trying to spread the word, by setting up a Facebook page, an online petition and going from door to door. "I've had a lot of people calling me and saying 'that's ridiculous; that won't go  ahead'," said Alison Asher, whose daughter Coco has a rare blood condition and attends the school. "But the thing is, if nobody objects, it could get through." Concerned parent and local real estate agent Ian Suter, who presented the formal submission to council, said he and his wife Linda were very worried about the health concerns a service station development would raise, as well as traffic problems at the busy intersection. "We have a few attorneys and solicitors who are parents at the school who have helped (prepare this formal submission) and they have the knowledge and the expertise that's required to fight the beast that this is," Mr Suter added. "The school and the Lutheran Council have been tight-lipped about this." Mr Suter, who has three children at the school, said it was through word of mouth that he heard about the proposal. "I didn't even see the sign. I drove in, picked up the three kids and didn't see a thing," he said. "I'm sure there are a lot of parents who missed it, too." Objections include that the proposed development is not compatible with adjacent uses, does not maintain the safety of people, and more specifically children, and does not comply with the Noosa Plan. Mr Suter said there were many points of objection outlined in the submission, including the fact the proposed development did not comply with the Noosa Plan. Mr Suter said: "The Noosa Plan states that it must be compatible, must maintain safety and must avoid adverse impact on amenities enjoyed by others ... not to mention it's just a few metres from the school boundary." Another parent, who declined to give her name, said her children were actively involved in the swimming program and trained at the pool "10 times a week between them". "They are healthy, active kids who love their sport and I'm concerned about the effect the vapours from a petrol station will have on their health." Noosa Council candidate Ingrid Jackson said she supported the worried parents. "I completely understand the concern expressed by parents and friends of students at Good Shepherd Lutheran College," Ms Jackson said. "In their own words they are 'extremely angry' about how the proposal to construct a service station adjacent to the school has been executed. "They have my support in their efforts to ensure a safe and secure environment for students and others who use the school grounds. "There are well proven methods of containing vapour emissions from petrol bowsers, but unfortunately the Queensland Government doesn't seem to have adopted them. "I understand they may be on the way in New South Wales and certainly they are well known and used in the United States. "In the absence of this type of containment, it seems to me there may be a risk, especially to vulnerable people and kids," Ms Jackson said. "I think the precautionary principle should apply here, that if an action has a suspected risk of causing harm to the public or to the environment, then those responsible should prove to the community that it is safe."